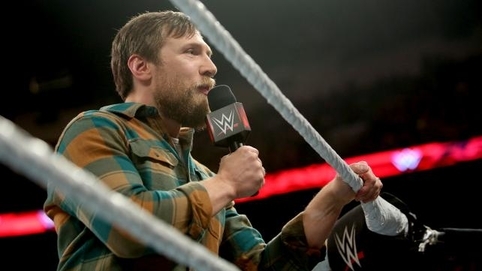 Daniel Bryan retired this week. For those not in the know, Daniel Bryan may have been the best “started from the bottom now we here” story in professional wrestling history. No joke, Bryan’s journey was something else. Check out the or the “Monster” WrestleMania hype video if you’d like to learn a bit more about him, and you can watch his retirement speech here. The thing about Daniel’s retirement was that it came at the top of his game, due to the effects of concussions on his body. Imagine being in your prime after having scratched and clawed for 16 years- loved the world over- only to have everything taken from you in an instant due to circumstances out of your control. This is what happened to Daniel Bryan, and his recent retirement should have been ridiculously depressing. Instead of coming out and crying to the heavens about his luck, instead of cursing the doctors who diagnosed him, he summed up his entire career and his feelings at that moment in one word. He spoke of how grateful he was for what he had; an amazing career, a wife he met while working his dream job, and fans who rallied behind him to propel his career to incredible heights. It was an incredibly humble retirement from an incredibly humble individual, and once I wiped the tears away (yeah I cried at something pro wrestling related- come at me), I found myself reflecting on that single word. Transitioning from working for one of the world’s biggest entertainment companies to working for myself has not been easy. I’ve gone through some tough days already, and I’m sure more tough days are ahead. But what keeps me going every day aren’t the complaints, the shortcomings, and the dark days. What keeps me going can be summed up in one word. I’m grateful that with every passing day, I become a stronger entrepreneur than I was the day before. I’m grateful for a wife who, when I told her what I wanted to do post-WWE, said, “What took you so long?” I’m grateful for the relationships I’ve made in such a short amount of time, and for the ability to wake up every morning and believe it when I tell myself that I love what I do. Yeah…this gratitude thing is kinda dope. So what are you supposed to take away from all of this? Psh, hell if I know. We’ve all got our individual struggles, but for me, taking a moment or two each day to celebrate some of the positive in my life never hurts. So I suppose if there’s anything you can take away from Daniel Bryan’s retirement, and anything you can take away from reading the ramblings of a never-was-writer-turned-voice-actor, it can probably be summed up in one simple word. Wait, no- my bad. I mean to say- eh, forget it. You get it by now.